Another weekend of racing once again back down in Wales. This weekend saw me racing in the Valley, on a good day this course has been known to produce some phenomenal times, Hutchinson holds the men’s 25-mile record in 45 mins 46 secs, which is an average of 32.8mph! The last few weeks I’ve found some awesome bed and breakfasts but every once in a while, you seem to stumble across a Fawlty Towers or a House of Horrors. This weekend was the latter! After one room change, I then snapped the door knob off with the key inside and having to ring reception to let me out the other side. I saw couples check-in then check-out within five minutes of arriving. I’m not sure what the guests thought of me when I decided a post-drive spin in the car park would be a good idea. Certainly got the attention of a few of the guests and locals! The course started for the first mile and a half on a country road before turning onto the A635 and heading down to Neath. When I say “down” I literally mean down – there is an awesome hill, you can’t beat going fast with a deep section and the sound of a disk whirring on your bike, just a shy 42mph maximum clocked, into a headwind! I managed a course pb in far from ideal conditions of 55.26, which is 27.1mph, just a minute behind Olympian & World Champion Wendy Houvenhagel. After leaving the race, dressed in a fleece, winter coat, woolly hat I got 20-miles out of the valleys to be back in 20 degrees and glorious sunshine – I’m sure the passers-by in the cars must have been wondering which country I’d just arrived from! For me racing is more than just about the race, it’s also about travelling, meeting new people, visiting new places and the adventures along the way. 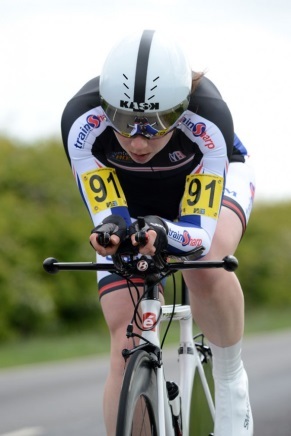 Onto next weekend at the National Team Time Trial Championships in Northumberland! Part 3 of What Have We Learned at the 2013 Giro? Tagged bex, merlin athletes, pro, pro cycling, team merlin. Bookmark the permalink.